Being an artist, I often have people ask me if I hope Isabel is artistic when she grows up. I honestly do not care if she is an artist or in the circus, but there are 3 things I hope for my daughter. First of all, that she would love the Lord with all her heart and that she will use that love to be a guideline for the decisions that she makes. Second, that she would be genuinely happy - joyful even. And thirdly, that she would love to read. Daddy Drew and I love to read. To us, reading is educational, entertainment, escape... It takes me to places I would not otherwise go and, I believe, makes me a more well rounded individual. There is so much that can be gleaned from reading - far beyond learning facts, reading helps to develop and maintain your imagination. With this in mind, I try to make it part of our nighttime routine to read to Isabel. Bath, jammies, book, bottle bed. 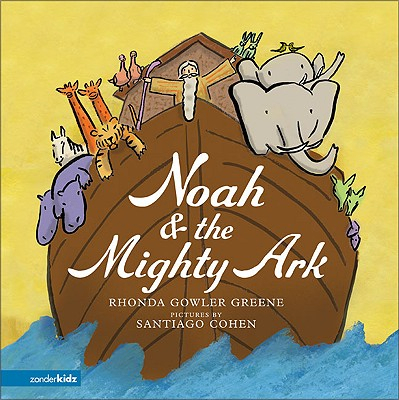 Tonight, our book was Noah & the Mighty Ark by Rhonda Gowler Greene and illustrated by Santiago Cohen. This is a very simple, yet lovely version of the Noah story. The story is written in a simple rhyming scheme. As a graphic designer, I appreciate the layout and font used in this book, and also found it unique and wonderful that some words are emphasized by variations in text size and spacing. The illustrations are beautiful. Very painterly images that seem to go perfectly with the theme of a giant rain and animals on the ark. The colors are vibrant without being obnoxious and definitely hold Isabel's attention. All in all, this is a great children's story that I will not mind reading over and over again. Tomorrow night, I plan to break out the board book version of The Lorax that I picked up at Half Price Books yesterday!